A few posts ago I showed you how to build a Boolean Logic Rules Engine in Neo4j. What I like about it is that we’ve pre-calculated all our potential paths, so it’s just a matter of matching up our facts to the paths to get to the rule and we’re done. But today I am going to show you a different approach where we are going to have to calculate what is true as we go along a decision tree to see which answer we get to. Yes, it will be a bit slower than the first approach, but we avoid pre-calculation. It also makes things a bit more dynamic, as we can change the decision tree variables on the fly. The idea is to merge code and data into one, to gain the benefit of agility. Let’s model a super simple decision tree in Neo4j. Imagine you are a “bouncer” at a club, and the club policy is that anyone over 21 is allowed in, anyone under 18 is not allowed, but they make a special case where women 18 and older are allowed in. What we have here is a “Tree” node with an id property of “bar entrance” in green, two “Answer” nodes (yes and no) in red, and two Rule nodes in yellow. The first rule node asks, is the age greater than or equal to 21. It has an “IS_TRUE” relationship to the “yes” Answer node, and an “IS_FALSE” relationship to the second Rule node. The second Rule node asks if the age is greater than or equal to 18, AND the gender is “female”. It also has an “IS_TRUE” relationship to the “yes” Answer node, and an “IS_FALSE” relationship to the “no” Answer node. It would return a path, because we want to know how it got to the answer, not just what the answer is. 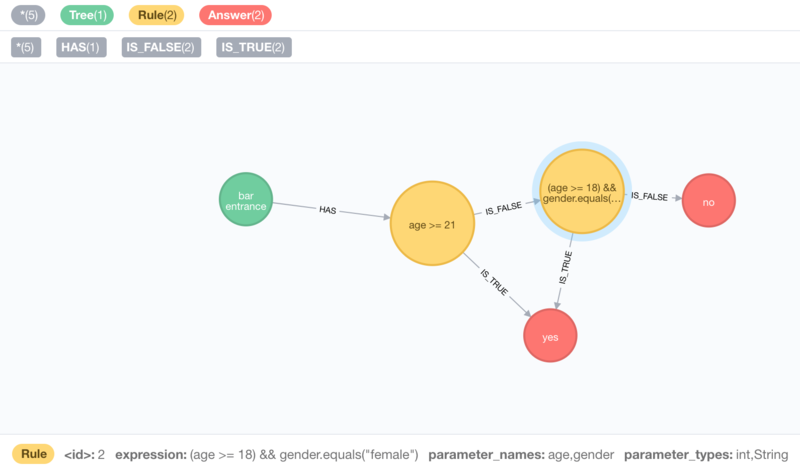 Neo4j is pretty good at traversing nodes and relationships, but it doesn’t really know how to interpret an expression like “age >= 21”. It needs some way to compile that expression and evaluate it. To accomplish this task we can add Janino to Neo4j. We will see it in action later, let’s get the stored procedure setup first. We will first find the tree we care about by getting the id in the parameters, and if we find it return the path in our decisionPath method. // Which Decision Tree are we interested in? // If we get to an Answer stop traversing, we found a valid path. // If not, continue down this path if there is anything else to find. Now on to the expander. In the constructor, we will take a Map of facts holding the key and value of the things we know. We will also create a new ExpressionEvaluator and set it to be a boolean type. This means it will evaluate an expression and return true or false. // If we have Rules to evaluate, go do that. Now, once we get to a Rule Node. We pass it to the isTrue method. If it evaluates to True, it continues down the IS_TRUE relationship. If it evaluates to False, it continues down the IS_FALSE relationship. Pretty straight forward right? // Could not continue this way! …and call the stored procedure with different parameters. A 20 year old male? A 19 year old female? Pretty neat right? You can make pretty simple or extremely complicated decision trees and change them on the fly, Neo4j will read the properties of the Rule nodes with every request. You can keep multiple versions of decision trees and compare their results, you can create potential decision trees and run your old facts through, etc. As always the source code is on github, enjoy. Great post. I’ve been wanting to rewrite app.hoppa.io (alpha) in neo4j, but haven’t had the time yet. I looked at this with interest, as I am looking to integrate my rule engine – a potential product (Ritc – ritc.io) – loosely coupled – with neo4j. So our detailed assumptions are different, but our visions seem to be similar, at least from what I see here. I think there is great potential connecting these two technologies.